Human Small Airway Epithelial Cells (HSAEpC) are isolated from the distal portion of lung tissue in the bronchiole area of the respiratory tract. Located in a region critical to gas exchange and immune response, HSAEpC provide an in vitro model to research cell biology, immunology and pharmaceutical drug discovery. The small (pulmonary) epithelium forms a continuous lining in the airways, offering mechanical and immunological barriers against the external environment, physically protecting the underlying submucosa. For general cell biology and airway function, the cells provide insights into pulmonary fluid balance, vascular and airway homeostasis and even the lung microbiome. Other work highlights epithelial cell junction integrity, and maintenance of the alveolar barrier integrity that provides first line host defense against inhaled pathogens. HSAEpC help unravel inflammatory signaling pathways, transcription factors and gene expression cascades. Decades of work in lung remodeling, wound healing and repair of surface airway epithelium damage have more recently paved the way to lung organoids and 3D models of small airway epithelium. Primary HSAEpC offer physiological relevance to the study of respiratory infection, recognition, and immune responses to bacteria, viruses and other foreign invaders like nanoparticles, air pollution and cigarette smoke. Such insults trigger production of chemokines, cytokines and lipids that mediate inflammation and recruit inflammatory cells. HSAEpC dysregulation has also be studied in terms of apoptosis, superoxide production and the effects of hypoxia or radiation. HSAEpC are targeted in chronic diseases like bronchiolitis, asthma, COPD, cystic fibrosis, pulmonary hypertension and lung cancer. Accordingly, the cells find increasing applications for drug discovery assays, in the hope to identify new therapeutic options to treat or prevent airway disorders. Such tests included compound screening, toxicology, drug uptake and response, in formats ranging from standard 2D assays and microplates to 3D tissue models and airway-on-a-chip technology. (Click to Enlarge) Human Small Airway Epithelial Cells (HSAEpC) play important roles in gas exchange, immune response and barrier function. They are available cryopreserved, as fresh proliferating cells, or in convenient kits containing media and subculture reagents. 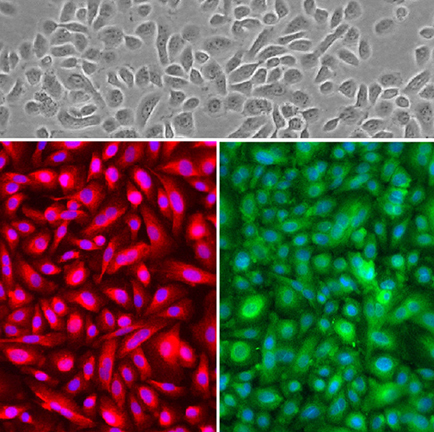 Staining: CK18 (red) and CK19 (green).